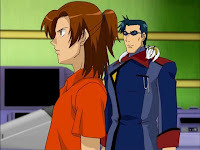 Digimon: System Restore: Data Squad Episode 01: THERE ARE MONSTERS AMONG US! Every season is very quick to make it clear to us that its respective gogglehead is an idiot. They might be a different breed of idiot like Takato, and there might even be a disclaimer stating that the idiot may be capable of extreme brilliance like Mikey. Nobody's confusing Marcus Damon for a genius, but he does some pretty slick things early on that make it clear that he's not just an idiot. He's a proud, loyal, aggressive, rebellious freak of an idiot. For all the goggleheads we've met so far, the closest comparison would be Davis. Both are very simple-minded and both have this incredible knack for filtering out meaningless fluff and determining what's right. But while Davis was arbitrary and pieced his wisdom seemingly from thin air, Marcus has what is best deemed The Marcus Code. It's a set of strict tenets that he follows religiously. We uncover two parts of The Marcus Code in this episode. One is that the best way to judge someone's character is to fight them and see how they fare. The other is that if someone swears their loyalty to you, you must show loyalty right back. It's an odd, often nonsensical set of rules to live by, but boy do they work. After Agumon's escape into the city, DATS flips the hell out and throws all its government cover-up powers (which sadly amounts to little more than police tape and Yoshi) into capturing it. Marcus has no preconceived notions about this orange monster classified Raptor-1. He's determined to spar with him and make his own judgments. After trading blows for an afternoon, he's impressed with Agumon and concedes a draw. 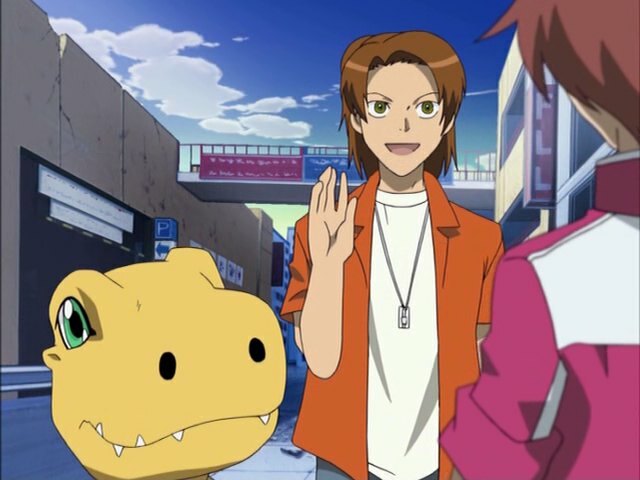 Agumon is so impressed with this human's methodology that he swears allegiance. Yoshi just stands there slack-jawed at the whole thing. Yoshi's introduction, for what's its worth, is fascinating in how little attention she actually gets. 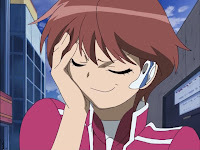 The only other main characters who started the series already with a digivice and a partner were Henry and Rika. Rika's introduction was a full-on dream sequence praising her awesomeness. With Yoshi, if it weren't for the opening credits, we wouldn't be totally confident that she's supposed to be a main character. Despite being the first one we see, she steps into the background to allow us to see the genesis of Marcus and Agumon's relationship. That's fine, but we are left guessing about her real opinion of Digimon. She's assertive and confident enough when things are under control, but a confused bystander once anything weird happens. Makes you wonder if she's a legitimate destined savior of the Digital World or just a clock-punching DATS employee. The reaction DATS has to Agumon, and Marcus's subsequent spurning of them, points out an interesting hypocrisy within the organization that sets the tone for the entire story. It feels like Hypnos, it kinda looks like Hypnos, but it has one huge difference: all of the employees have Digimon partners. That shows that they're sympathetic to Digimon and are just trying to keep the two sides from hurting each other, right? Not quite. Not only are most of the Digimon at DATS employed as servants (save for Kudamon who just sits around Sampson's neck being awesome) but human prejudice still drives their actions. Of course Agumon attacked the hamburger place- he's a monster! Of course Agumon can't eat people food- he's a monster! Of course Agumon beat up all those poor schmoes- he's a monster! No way Marcus McPunchy would do something like that! Marcus seems to sniff this out quickly and dismisses them as not jiving with The Marcus Code. After learning that it's Kokatorimon that attacked, Marcus fights back on the grounds that Kokatorimon is why Agumon was blamed. He delivers a mighty punch, gets a random digivice from Some Guy and is told that his energized DNA will make Agumon evolve. That makes no sense whatsoever... but surely it fits in line with The Marcus Code, and therefore we roll with it. I debated for a long time whether to keep the episode title in all caps. Unfortunately, I'm trying to be case sensitive about episode titles, no matter how inconsistent they've been. For this episode only, the Loose Data section has been renamed accordingly. While the writing is fine, the dub direction does seem to be a bit off all of a sudden. Some of the dialog sounds like it could have been delivered better, particularly with Yoshi and Marcus. It's still an ace cast, so it's hard to really place blame anywhere but the director. Marcus calls Yoshi “toots” and “dollface” in this episode, because pejorative terms towards women that went out of fashion in the roaring 20s are less offensive and more fun. It's one thing to cut out images of direct violence. It's another to replace them with cartoony 80s explosion graphics. Did we really need the sudden dramatic rain after Agumon was knocked out of the Kokatorimon battle? That just looked tacky. I'm not sure whether to admire or admonish the dub for working in ultimate fighting as a reason for Marcus's fighting moves and why he was attacked by all those guys. I get that they don't want to portray Marcus as some sort of gang leader, but is that the best could do? It might be. If his dub name was really Marcus McPunchy I would go watch the entire Data Squad dub right now! That is the name of an Ultimate Fighter! Interesting what you say about the cast because the english voice list looks like it has talent but the little tiny snippet I saw just lacked something. As much as I FREAKIN ADMIRE Marcus, I will admit that his dub voice did come off as a little whiny in the early episodes. Good thing that improved. I was a bit disapointed about how Digimon were a secret in this show. Even from the first episode I was thinking "Digimon everywhere? Could it be like a sequel to one of the earlier seasons, examining how humans react after the emergence of Digimon?" Well kind of, but no more than Tamers. Think about it, what would have changed if the general public knew about Digimon? Most of them aren't even that surprised when they see one. The only thing that we'd really lose is the mind wiping episode.